These technologies belong to so called close mould ones, which reduce evaporation of harmful styrene from polyester resins during processing and curing. With respect to strict regulations concerning quality of working conditions and reduction of styrene emissions to the environment close moulding methods are gaining the major importance and expansion contrary to hand lay-up and spray-up. 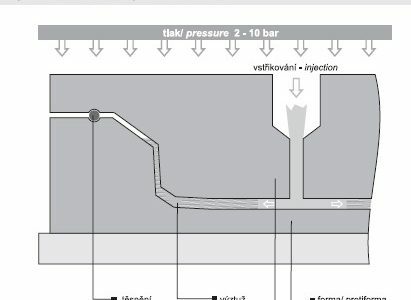 All modifications of these technologies come out of liquid resin systems which impregnate dry reinforcement placed in the mould using injection or injection in conjunction with vacuum. Moulds are robust construction made of metal or polymer concrete to bear high internal press. Dry reinforcement is laid into the mould, usually provided with gelcoat. Preformed reinforcement can be used in the case of big series production. Reinforcement based on various fibres should have the structure which enables the easy flow of resin system to achieve the complete impregnation within short time. The mould is then closed with similar rigid upper part and it is fixed by quick-closing clamps. The injection gun is placed into inlet, the rein is fed from special equipment – high pressure pump with coupled mixing of resin and initiator. The resin is injected until reaches outlets usually placed close to periphery of the mould. This indicates that the reinforcement is fully impregnated in overall part volume. Matrix system is chosen to cure quickly within 10-20 minutes using exotherm heat. Reinforcement: Glass mats from endless fibres (for instance Unifilo) or stitch mats or special complex glass mat + internal tenuous mat made of synthetic or glass fibres (type Rovicore or Combiflow), sometimes in combination with surfacing light weight mats. Resins: Mostly polyester resins with built-in accelerator, often extended with low-cost fillers (calcium carbonate, alumina trihydrate) to reduce the cost or to tailor some properties as fire resistance or shrinkage (special types Class A for automotive parts ready-to-use without additional surface treatment. Thanks to short production cycles and high reproducible quality pressure RTM is suitable for large series – hundreds till thousands of mouldings. It is necessary to take into account of relatively high investment cost for injection equipment and high cost of moulds. The cost for mould counter- piece can be reduced by using so called distant wax foils of various thickness corresponding with the product thickness. In this case it is not necessary to make the second model (plug). This technology is a modification of classic RTM when vacuum helps to impregnation process. Usage of less robust mould construction because of lower press (0,4 – 1 bar) is an advantage of this technology. It enables the production of bigger pieces. The same as in the case of high pressure RTM technology + gasket profiles and strips to ensure vacuum tightness. Technology is similar to RTM light, but there is no need to use injection equipment. 1) Vacuum impregnation using flexible upper mould part. Lower mould part is stiff like by RTM light with exhaustion channel, upper part mostly made of GRP has flexible to a certain extent what controls the pressure. Closing force and impregnation is caused by 0.6 – 0.8 bar vacuum. Resin is fed from container or it is spread onto dry reinforcement before the mould is closed. This method is suitable for both side smooth parts. Into the product could be incorporated core materials – foams or honeycombs – to create the sandwich structure. 2) Vacuum impregnation under the flexible foil. This technology is very similar to vacuum bag technology. The lower mould part is the same type as by hand lay-up. Instead of second mould part the flexible foil is used tightened it with sealing tapes to the mould edges. Initiated resin is aspirated from container, in case of large structures the matrix is distributed to distant places by perforated tubes. Vacuum is applied on the mould circumference using channels created by gasket profiles. 3) SCRIMP method is very similar to the method 2), but the resin distribution is provided by means of special net placed over the all surface of dry reinforcement charge. As the last layer is again used the flexible foil. Reinforcement: Reinforcing materials of all kinds from fabrics based on glass, carbon or aramid fibres or combination of them with various weight, weaving style and different orientation to special stitched or complex mats. It is possible to insert foam or honeycomb materials to make the sandwich structures or to use semi-sandwich materials of Coremat type. Also peel plies, tapes and surface mats are used. Resins: Low viscosity polyester and epoxy resins. Matrix systems with long term open time are used for large mouldings with respect to the long impregnation time. Vacuum infusion methods are particularly suitable for large structures as hulls and decks of boats, big mouldings used as body of locomotives and wagons, wind mill blades etc. where other methods would be considerably time absorbing (hand lay-up) or unbearable expensive (RTM or hot press moulding). On the other hand the working cycles are longer, in some cases even up to several hours. Infusion processes are suitable for small and middle series.